As the seasons change we get to experience the stunning unfolding of autumn leaves, cold winter days, flowering spring, and brilliant summer. Flowers and foliage alike undergo a fabulous transformation, as we often do too. We cuddle up for winter, trading our lighter clothes for warm knits and boots, and reverse the process as warmer weather approaches, seeking out brighter colours and spending more and more time under the sun. 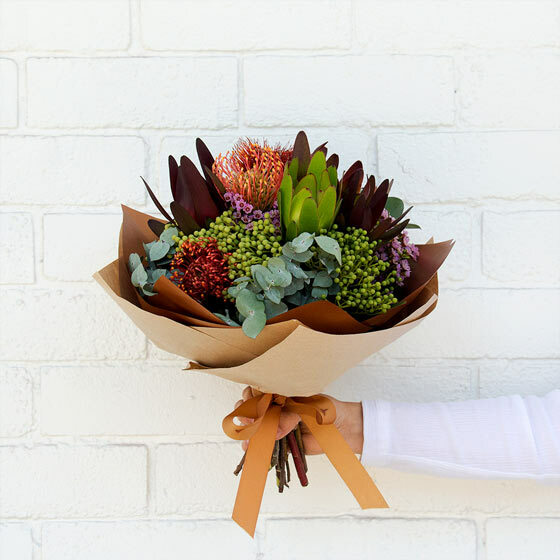 At Interflora Australia HQ we love the change of seasons for another reason; we get to welcome a new collection of our floral bouquet and arrangements to swoon over! Our 2018 Winter Spring Collection is brimming with floral combinations expertly designed to evoke the feeling of this time of year. With soft white blooms in textures reminiscent of snow, fiery red natives and wildflowers to capture the last remaining autumn leaves, sweet pastels perfect for the arrival of spring, and bright bouquets that herald the summer days to come. With a design ideal for any taste, occasion and budget, we’re sure that you will love our new collection as much as we do! A luminous arrangement featuring sunshine yellow roses, lilies and chrysanthemums, as well as striking contrasted blue iris. 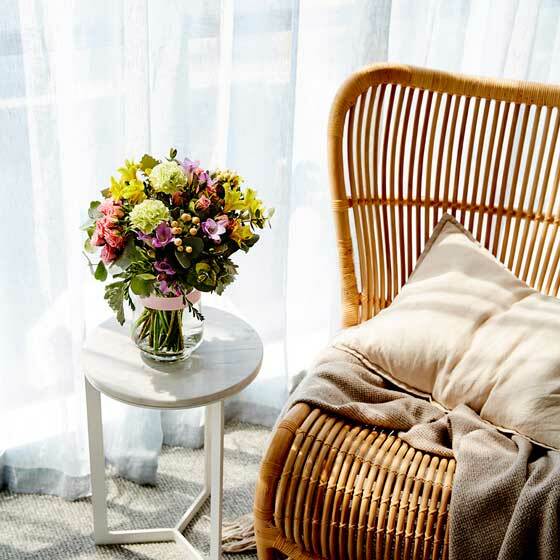 An ideal gift for your mum or aunt, these gorgeous flowers are expertly presented in a low glass vase with dracaena leaf. We’re looking forward to brightening dreary winter days with Alana. This fiery bouquet will steal your heart! We love the combination of bright red and orange leucadendron and banksia, rustic pink waxflowers, and silver toned eucalyptus. Perfect for any native and wildflower flower, and for almost any occasion, we’ll be sending Malina to our sisters and best friends for birthdays and to say congratulations. This elegant fishbowl presentation will be a hit. Featuring white hyacinths with mint green chrysanthemums and umbrella fern, Lulu is a fabulous gesture for any occasion or just because. We’ll be sending it to congratulate our loved ones on new jobs and well deserved promotions. A crowd favourite, Harley is the perfect reminder of treasured winter days. 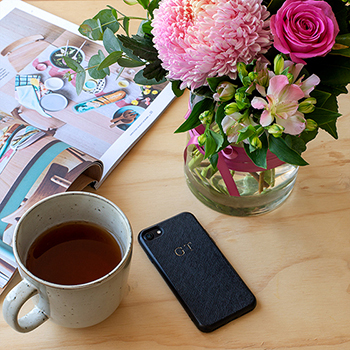 Modern and stylish, your minimalist pals will adore this gift. 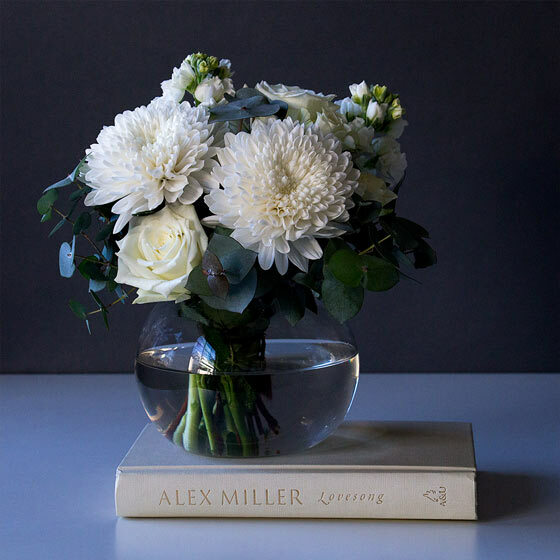 Featuring fluffy white disbud chrysanthemums and elegant roses with silver toned eucalyptus, this arrangement is presented in a glass fishbowl. We’ll take one of these on every desk in our office please! Every floral collection must have a succulent terrarium inclusion! Our newest arrangement of purple and green rosette succulents in a fishbowl vase is our favourite yet. Ideal for your loved ones who prefer plants over bouquets, or when you want their gift to last long after the occasion. Trust us; they will adore the cute Tina. A classic lily wrap for the classic beauty in your life! Pink lovers will be delighted by Lilian, featuring Asiatic lilies wrapped in burgundy paper and tied with hessian ribbon. We’ll be sending this to all the winter spring birthday girls we know. Feminine and breathtaking, Nova will be adored by your mum, best friend, colleagues and everyone in between. 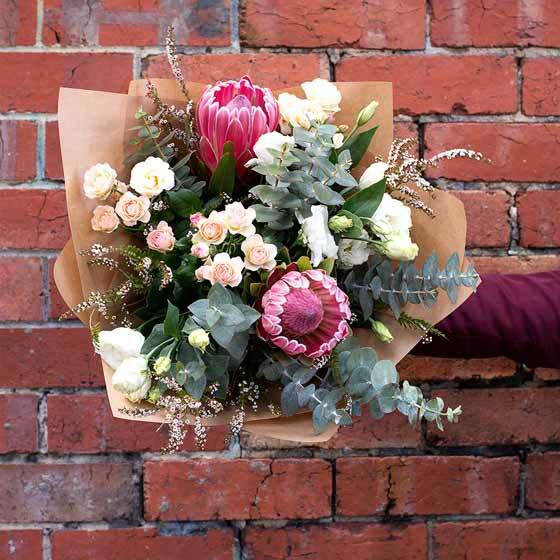 A mix of traditional florals with stunning pink proteas and native eucalyptus, this bouquet is wrapped in on-trend brown paper. They will love adorning their home with this arrival. 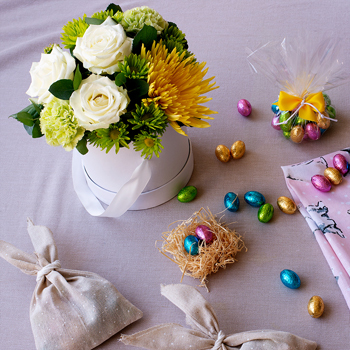 Which of these Winter Spring arrangements is your favourite? 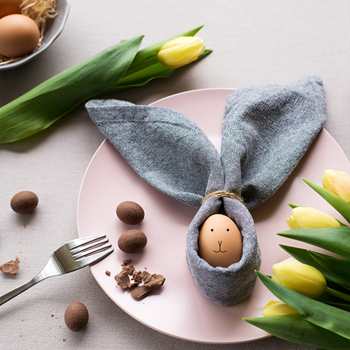 Visit our 2018 Winter Spring Pinterest Board. Shop our 2018 Winter Spring Collection.